It has only been a few days since Deepika Padukone and Ranveer Singh got married in an intimate yet lavish ceremony in Italy and Bollywood is set to see yet another awaited wedding. India’s very own desi girl, Priyanka Chopra will be tying the knot with Nick Jonas and it seems as though no one can really keep calm any longer! Speculations about their nuptials have taken over both the entertainment as well as wedding media and needless to say, a lot is being said about what everyone at their celebrations can expect to witness. Here is everything that we know so far about #NickYanka wedding. Reports say that the couple will be getting married on December 2. The Mehndi and Sangeet ceremony will take place on November 29 followed by a cocktail party on November 30. The Haldi ceremony will take place on December 1 followed by the wedding. The actress seems to have chosen not one, but two heritage properties in Jodhpur for her nuptials. While her sangeet will reportedly take place at the grand Mehrangarh Fort, the wedding ceremony will be hosted at the Taj Umaid Bhawan Palace which is also the residence of the current royal family of Jodhpur. 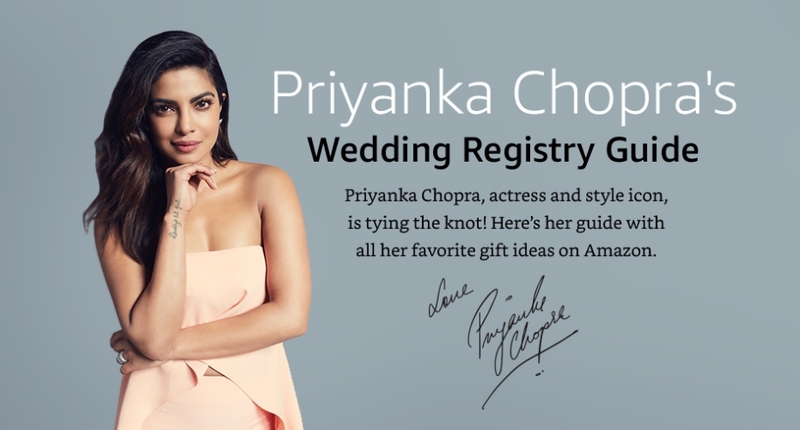 The actress has partnered with Amazon to set up a $14,000 wedding registry that includes all the must-haves for her to start her new life! The list includes everything from cooking utensils and home decor essentials to a raincoat for her dog Diana, and a pair of rollerblade skates. Amazon will also be making a $100,000 donation to UNICEF as part of this partnership. Since Priyanka and Nick come from vastly different cultural backgrounds, the duo is expected to have two ceremonies to honor the traditions of both the families. They will be saying ‘I Do’ a day prior to their Pheras that will take place on December 2nd. Nick Jonas is a singer of international fame and it is only fitting that he will be seen serenading his lady love at their sangeet. It will allegedly be a 45-minute performance which, we’re sure, will leave everyone present there swooning! Some other reports also suggest that Bollywood dance choreographer Ganesh Hegde will be in charge of teaching their close-ones dance moves for their performance that night. Wedding photographs are supposed to be priceless, but Nick and Priyanka decided to put a price to it after all. They have sold their pictures to an international magazine for a whopping Rs. 18 crores (2.5 million dollars) and we can bet the money is all going to a good cause. Only a few days ago Priyanka Chopra shared a picture from the Jimmy Choo store in Paris. From what we hear, the bride-to-be was there shopping for the perfect shoes to wear on the much anticipated day. It has been reported by The Sun that Priyanka is likely to wear red instead of traditional white to say “I Do” and the bridesmaids are expected to wear Ralph Lauren. The entire Jonas clan, as well as Joe’s fiancé, Game of Thrones’ Sophie Turner, are joining the celebrations, the couple is also expected to have many high profile guests in attendance including Hollywood celebrities. But we are most interested in knowing if the Duke and Duchess of Sussex are going to be present given that Priyanka was a bridesmaid at Meghan Markle’s wedding. This entry was posted on Friday, November 23rd, 2018 at 10:02 am	and is filed under Celebrity News. You can follow any responses to this entry through the RSS 2.0 feed. Both comments and pings are currently closed.